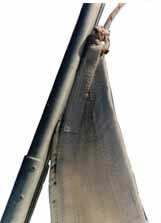 We will supply the exact sail luff measurements with your order. There is no problem if your sail is short, however if it is too long, your sailmaker will be able to 'trim' the sail to fit your new system with minimal sail area loss. Do not be confused with sail conversions, we would be pleased to assist you or discuss your individual requirements.